Appointment of Brett Kavanaugh to the Supreme Court is part of a disciplined long-term strategy by the American right wing to lock in its power for generations to come. It means the rest of the corporate Republican power play—gerrymandering, voter suppression and virtually unlimited campaign spending—is unrepealable. The Supreme Court has become a House of Lords—a legislature of last resort. During my lifetime, it abolished school segregation, legalized abortion, legalized gay marriage, blocked campaign finance reform, and reshaped Obamacare. It has a potential veto power over virtually anything Congress might do. Progressive and Democratic leaders have no long-term strategy of their own for the Supreme Court or anything else. Instead they merely react to events, often in ways that are obviously futile—asking the Electoral College to overturn the results of the 2016 election, hoping Russiagate will drive President Trump from office, planning to impeach Kavanaugh in the future. Even if the Democratic leaders got a strategy and stuck to it, it could take 10 or 20 years or more to undo what the right-wing corporatist movement has accomplished. It took decades for the corporate right to bring the United States to where it is today, and changing things back will not be done overnight—if ever. You could say there is “a vast right-wing conspiracy” except that it is not secret. It has always been out in the open for anyone to see, if they care to look. I wrote about this at length in a previous post. 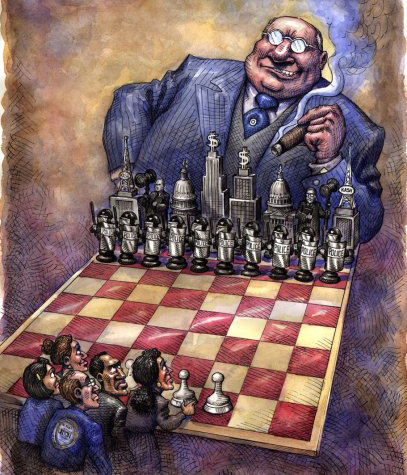 The strategic corporate movement began with the Lewis Powell memo to the U.S. Chamber of Commerce, in which the future Supreme Court justice argued that American business had to act strategically to protect its own position in society. The result was the creation of a media, research and lobbying infrastructure, such Fox News, the Heritage Foundation and the American Legislative Exchange Council, which was tightly integrated with the corporate wing of the Republican Party. The Federalist Society, founded in 1982, grooms reliably pro-corporate lawyers for judicial appointments. It is true that there are many institutions with a built-in left-wing bias. But the bias is unconscious and not a party line based on a planned, coordinated strategy. The corporate movement crossed an ethical line with the REDMAP campaign. In a targeted campaign, they gained control of both houses of 25 state legislatures in 2010, and proceeded to re-draw their congressional and state legislative districts so as to lock in a Republican majority. At the same time they enacted laws making it more difficult for racial minorities to vote and canceling voter registrations, mainly of racial minorities, for bogus reasons. The main obstacle to this strategy was the federal courts, which overruled the more obvious attempts to rig elections and disenfranchise voters. Mitch McConnell, the Senate Republican leader since 2007, has removed this obstacle by his partisan and successful effort to give stack the judiciary in favor of the Republicans. He made it his priority to hold up appointments to the federal bench when Barack Obama was President and then to push through appointments after Donald Trump took office. When the Republicans were out of power, they took advantage of the “blue slip” tradition, whereby Senators have the right to block a judicial appointment in their states. They used procedural rules to slow down President Obama’s judicial appointments, creating a backlog of vacancies. During the last year of the Obama administration, McConnell simply refused to permit consideration of Obama’s appointment of Merrick Garland, a moderately conservative but non-partisan judge. There is no basis for such a refusal except partisanship. It is an example of politics as a moral equivalent of war. Now that Donald Trump is in the White House, judicial appointments go through quickly, and “blue slips” are a thing of the past. Thanks to McConnell, the corporate movement has achieved its goal. What could be done about this? There is a Constitutional remedy, but it is one I would shrink from advocating. Article III, Section One of the Constitution mandates that there be a Supreme Court and that judges hold their offices “during good behavior,” but it otherwise gives Congress the power to define the structure of the judiciary. Nothing in the Constitution or the laws would prevent a future Democratic Congress from restructuring the lower courts, abolishing some courts and creating new ones, and expanding the number of Supreme Court justices so as to create a left-wing majority. This would be politically possible if there is a complete breakdown in respect for the moral authority of the courts. I hope this never happens. But if the federal judiciary is to be subordinated to partisan politics, this is what logically follows. Kevin Drum of Mother Jones wrote a reminder of how much the Supreme Court has become a legislature of last resort. Consider. Neither Congress nor the states can pass laws that outlaw abortion. The Supreme Court won’t let them. Likewise, Congress has tried to pass various forms of campaign finance reform for more than 40 years, but every time the Supreme Court steps in to hobble it. Gay marriage is the law of the land because the Supreme Court says so. Congress tried to renew the Voting Rights Act, but the Supreme Court killed it—almost literally for no reason except that they were tired of it. Cities can no longer regulate handguns because after 200 years of silence, the Supreme Court suddenly decided it didn’t want cities to regulate handguns. They’ve wiped out affirmative action; prohibited states from banning interracial marriage; restricted police interrogation by insisting on the presence of counsel; banned prayer in public schools; elected a president in 2000; ruled that schools don’t need to be equally funded; and are almost certainly about to embark on a long line of rulings favoring corporations and restricting the regulatory power of the EPA and other agencies. Like me, you probably agree with some of these rulings and not others, but whether I or any other American citizen agrees or disagrees makes no difference. It is out of our hands. This is why Supreme Court appointments have become a partisan political issue. So much is at stake. I would be pleased to see a political truce based on a return to Justice Oliver Wendell Holmes’ philosophy of judicial restraint, but I don’t see a path to such a truce. The Powell Memo: A Call-to-Arms for Corporations by Bill Moyers. The Weekend at Yale That Changed American Politics by MIchael Kruse for POLITICO. The Republican Plan for a One-Party State by Rick Perlstein for the Washington Spectator. The 1 Percent Has a Dark Plot to Replace American Democracy With an Elite Plutocracy—And It’s Working by Leo Gerard for the Independent Media Institute. Kansas: Aftershocks from the epicenter of voter suppression by Sarah Smarsh for the Columbia Journalism Review. The Election Was Stolen—Here’s How by Greg Palast. 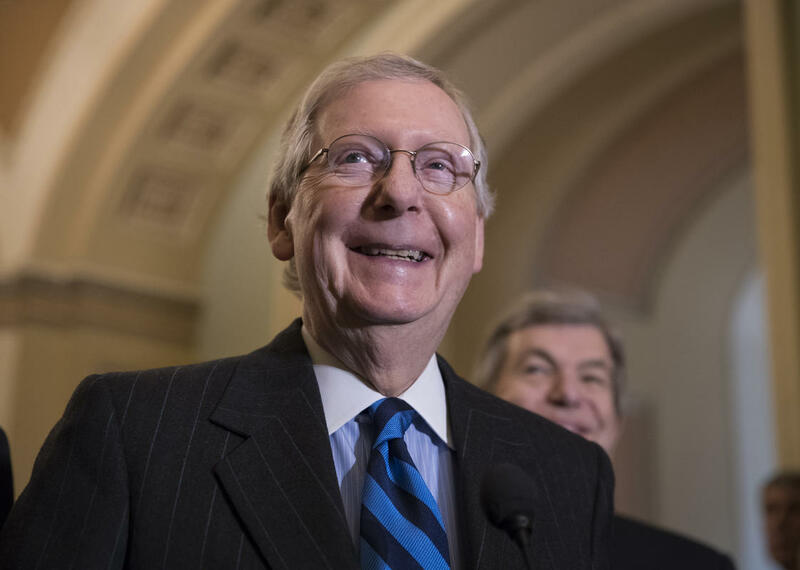 With little fanfare, Trump and McConnell reshape the nation’s circuit courts by Sean Sullivan and Mike DeBonis for The Washington Post. How the Trump Administration Is Remaking the Courts by Jason Zengarie for the New York Times magazine. The Democrats’ Little Bighorn by Pat Buchanan for The American Conservative. Partisan Warfare Will Shatter Our Constitution by Bruce Fein for The American Conservative. Will the Democrats Change the Subject? by J.D. Alt for Real Progressives USA. This entry was posted on October 11, 2018 at 1:20 pm and is filed under Abuse of Power, Law and Justice, Politics, Public Policy. You can follow any responses to this entry through the RSS 2.0 feed. You can leave a response, or trackback from your own site. Not so bad as all that. The Senate can vote to take any issue out of the court’s jurisdiction. It has done it before and will do it again. IIRC, the most recent was the big Tobacco settlement. SCOTUS really is the weakest of the 3 main branches. If the people don’t like the government, they’ll turn the GOP out, put in a Democrat Senate. If the Democrats are worth anything at all, they will take jurisdiction over the most urgent cases. If they are worthless, they’ll let SCOTUS to rule in maladaptive ways and use the outrage to heat up the voter base. Either way I expect a Democrat in the White House before any other justices get replaced. Just another 2 years. Clarence Thomas isn’t looking too healthy. Fred, my argument is that Republican control of Congress is in large part due to a rigged system, and that Republican control of the judiciary prevents that rigged system from being declared illegal or unconstitutional. Democratic leaders in Congress either don’t understand this or don’t care. Here’s a rundown on the Supreme Court justices and their ages. Stephen Breyer, Born August 15, 1938. Age 80. Clarence Thomas. Born June 30, 1948. Age 70. Samuel Alito. Born April 1, 1950. Age 68. Sonia Sotomayor. Born June 25, 1954. Age 64. John Roberts. Born Jan. 27, 1955. Age 63. Elena Kagan. Born April 28, 1960. Age 58. Brett Kavanaugh. Born Feb. 12, 1965. Age 53.